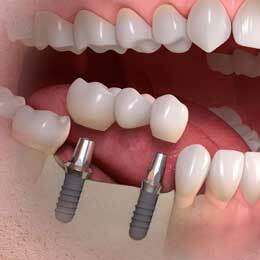 A Dental Implant is used to replace one or more missing teeth. The Implant is a titanium screw that replaces the root of your missing tooth and creates a secure and long lasting foundation on which to build. After the implant has integrated into your jawbone, an attachment is placed over the Implant, to which a crown, bridge or denture can be secured. The greatest care and skill is taken to colour match the rest of your teeth and keep your personalised bite. Implants at Pont Steffan are done in practice with our Implant Dentist Dr. Bharat Nagrani. If there is no tooth or Implant, as with a conventional bridge or partial denture, the bone may slowly recede and the shape of the face can change over time. 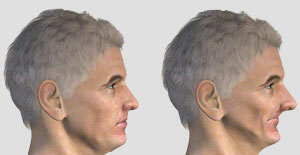 This can cause an ageing effect on your the appearance of your jaw shape shown in the image. Having a functioning set of teeth can improve your quality of life not only by eating well but also by restoring the shape and support to your whole face. When you lose a tooth, the gum and jawbone underneath begins to shrink which can cause a premature ageing effect. Losing a tooth or teeth can also affect your ability to chew properly which in turn can also alter your diet and nutrition. In a healthy mouth, the tooth root transmits chewing forces to the jaw [fig. 1], which helps to maintain bone. If one or more teeth are lost, these forces stop and the bone may slowly recede. As a result, the neighbouring teeth may slowly move inwards. This creates additional gaps [fig. 2] and can alter your bite. 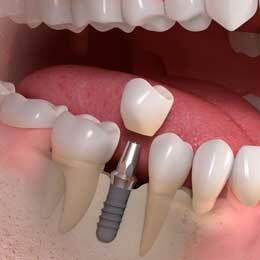 If you are missing a single tooth, a single dental implant can be preformed. This can prevent bone recession and neighbouring teeth shifting into the space, which can alter your bite. It also means that the neighbouring teeth will remain healthy and intact when compared to conventional methods. 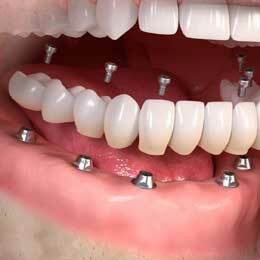 Replacing a gap of multiple teeth is also possible with dental implants. It can be achieved with a implant-supported bridge which again means that the neighbouring teeth are not affected as they would be with a conventional bridge or partial denture and that the jaw bone is preserved. If you are missing all of your teeth you may think that your only option is dentures, but you can in fact have all of your teeth replaced with implant-supported dentures. It is possible to have either a fixed solution to replace all your teeth or to have a removable denture for easy cleaning. How long does the whole treatment take? Each individual case is different, so treatment times will vary depending on the specific requirements of each case. Generally, treatment time typically takes between three and nine months. You will be provided with a bespoke treatment plan and a specific treatment time scale tailored to your individual requirements. At Pont Steffan Dental Practice we will work with you to ensure that you feel no discomfort during surgery. We can achieve this by using an effective local anaesthetic. As with any surgery there is always some risk. Dental Implant surgery is a well-proven, state-of-the-art medical dental technique that has been scientifically tested and used for decades. Potential risk factors may depend on your oral hygiene and/or pre-existing medical conditions. Your dentist will advise you on whether Implants are the best option for you. No. As long as your jaw bones are fully developed, you don’t have any significant medical risk factors and there is enough bone available. We understand that you do not want to be without your teeth. Whilst you’re having treatment with us we will endeavour to provide you with an interim solution during your healing process. If there is a case where you may be required to be without your teeth for the healing process, this will be explained to you prior to any treatment. It is advisable to take at least the next day following surgery off work, but many patients are able to return to work the following day. Your dentist will advise you if you may need additional time off. It is essential that you continue with your dental check-ups and hygiene visits during and after Implant treatment. Plaque and calculus have an adverse effect on the gum and bone that support natural teeth and Implants. However, the gum and bone supporting Implants are more susceptible to the detrimental effects of plaque and calculus. It is therefore essential to maintain excellent oral hygiene to ensure the long term success of Implants. You will be provided a bespoke maintenance and hygiene plan prior to beginning your treatment.